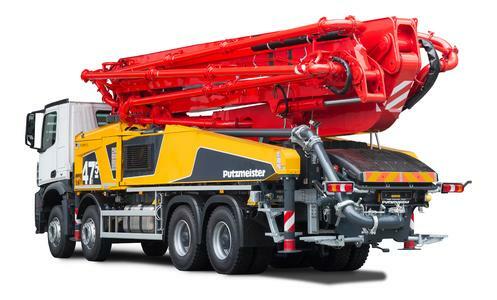 At the Bauma 2016 from 11th to 17th April in hall B6 booth 100, Putzmeister will present its latest truck-mounted concrete pump, the BSF 47-5. 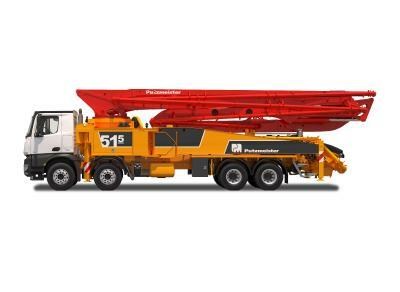 It features a 5-arm placing boom mounted on a 4-axle chassis. With a gross weight of less than 32 tons, it is one of the most lightweight machines in its class. 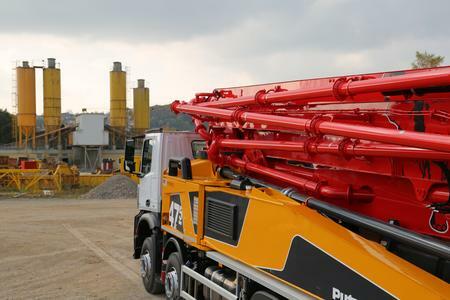 The newly designed 47-5 from Putzmeister raises the bar in terms of the weight, operation, safety and efficiency of concrete pumps. It weighs less than 32 tons including sufficient reserves for payload, water, fuel and other functional fluids. The 47-5 is extremely economical to run, as the operating costs of the machine have been reduced across the board. The individual components of the machine are highly resistant to wear. A high proportion of the components are completely maintenance-free. Overall, the machine achieves an exceptionally long service life and an attractive resale value. This has enabled the quantity of costly functional fluids such as hydraulic fluid used to be significantly reduced. The operating costs of the 47-5 remain extremely low throughout the entire service life of the machine. In terms of safety, the 47-5 is a clear winner: All current standards have been taken into account in full. Modern design and calculation principles have enabled the structure of the 47-5 to be optimized on all levels. The extremely flexible 5-arm boom with the roll-Z fold system has excellent slip characteristics, can be deployed quickly and makes optimal use of the available space. Dead space is largely avoided. This means that the machine has a wide range of applications and can be used flexibly on any construction site. The smooth behaviour of the arm further optimizes the application of the machine. Vibrations in the boom remain at a low level even at high delivery rates. These benefits require intelligent laying of the delivery line and a balanced progression of stiffness in the steel structure. This ensures that concrete distribution is safer and more efficient. As an option, the concrete pump can be set up with even smaller space requirements thanks to a new, flexible support. The sophisticated technology used in this support enables the telescopic front support legs to be adjusted to any length. This enables operation on construction sites with extremely limited space available. Equipped with ESC (Ergonic ® Setup Control), the range of applications and the working radius of the new 47-5 are significantly increased. The operator is supported with the safe and flexible machine setup. This effect becomes very clear in particular on long, strenuous days at work as concentration levels diminish. A special feature with Putzmeister is that the machine operator is provided with an image of the working area live on the display of the remote control, i.e. directly at the work place. Both the safety of the persons at the work site is significantly increased, and the investment is secure. The pump unit on the 47-5 has been comprehensively reworked and equipped with a significantly improved S transfer tube bearing. A chrome-plated delivery cylinder and an automatic centralized lubrication system for the entire pump are standard features. The pump has a delivery rate of up to 160 m³/h. This pump is the heart of the 47-5, and its design ensures that it can handle the high requirements of the construction sector. The base structure of the 47-5 is designed in accordance with the new I-frame concept. All parts are screwed in, enabling them to be replaced flexibly and at low cost. The wide flatbed with anti-slip surface provides sufficient space for attaching hoses and pipes. It also offers sufficient storage space for small and large accessories. The 800 litre water tank can be attached easily. The 47-5 is designed for ease of maintenance and enables easy access from all sides. Concrete pump operators can conveniently and precisely control the placing boom using the computer-based Ergonic® Boom Control system (EBC). The simple joystick control system enables precise operation of the boom with one hand. This means that concrete pump operators are free to concentrate more on their surroundings and the movement of the end hose. Putzmeister will present the new Ergonic® 2.0 control system generation at the Bauma. The fully electronic control system of the EPS (Ergonic® Pump System) pump is provided as standard in all BSF machines. It continuously regulates the operation of the concrete pump and the truck engine, reducing the effort required by the operator. The pump operator can display important information about the machine centrally on the Ergonic® Graphic Display on the radio remote control. The newly developed colour display on the 47-5 and the optimized menu structure enable data, parameter settings and error management to be read easily. 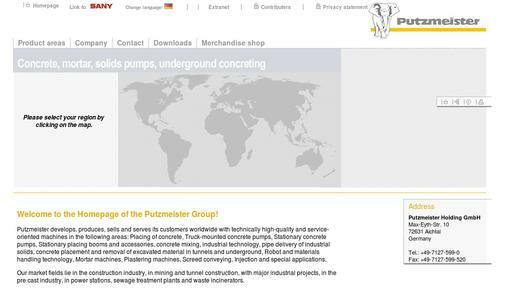 More than 50 years of experience have gone into the development of the Putzmeister concrete pumps. Constant innovations have opened up unprecedented possibilities for pumping and conveying concrete. This progress is based on the tried-and-tested and robust concrete pumps from Putzmeister, which are constantly being improved and adapted to meet modern requirements. The Putzmeister Group develops and produces machinery of high technological quality in the fields of concrete conveying, truck-mounted concrete pumps, stationary concrete pumps, placing booms and accessories, plant technology, conveying viscous industrial materials through pipes, concrete placement and transporting excavated material from tunnels and below ground, mortar machines, plastering machines, screed conveying, injection and specialist applications. Market segments include the construction industry, mining and tunnelling, large industrial projects, power plants and sewage treatment plants, as well as waste incineration plants, all over the world.